100% Money Back Guarantee if not completely satisfied. ABSOLUTELY NO RISK! Have you ever wondered "Is My House Haunted"? Most Real Haunted Houses are not the spooky haunted houses that you see in the movies. They are regular homes in regular neighborhoods and belong to people just like you and me. 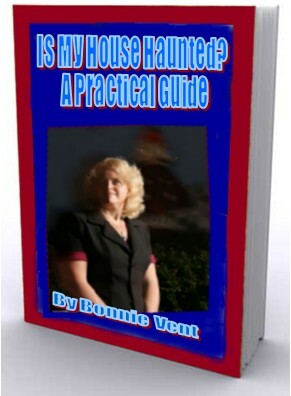 If you have been asking the question "What can I do if my house is haunted"; this book is for you. So, Who ya gonna call? No one!! This booklet will take you through the basic steps in determining what may or may not be going on in your home. Most people would rather keep this quiet. Do you really need a bunch of expensive gadgets or amatuer weekend thrill seekers telling you what is going on with your house. NO YOU DON'T. This book is delivered to you in the privacy of your own In-Box. There are NO SHIPPING CHARGES. You will receive the ebook plus customizable forms for documenting the activity. Written by nationally known medium Bonnie Vent, and based upon her 20+ years of research in this field. Look for normal explanations before assuming a haunting. I have ruled out the obvious reasons. Now what? EVP – Electronic Voice Phenomena.